June 9, 2014, 10:43 PM · These days, Alexander Markov tends to play a few Paganini Caprices at a time, rather than all of them in a single concert. "I still play them, but quite honestly, I don't like to play them all at once, because I made my point years ago. Now it's just a question of musically, is it really that necessary? I like to build my programs in a deeper, interesting way," Markov said, speaking to me over the phone from New York last week. Indeed, when he performed all 24 Paganini Caprices in one live recital in 1989, the feat was met with acclaim and astonishment. The accomplishment remains rare. The list of those who have done it has grown longer, but it's still not a long list: Ruggiero Ricci, Shlomo Mintz, Soovin Kim, James Ehnes, Rachel Barton Pine, Roman Simovic, Nikolay Madoyan, Kristof Barati and Ilya Gringolts are among them (see the bottom of this article for a more complete list). For anyone, the achievement takes courage, stamina, extraordinary technique and devotion. On Friday, Markov will perform in concert at Carnegie Hall with the Shattered Glass Ensemble, and during the evening "I'm going to do a set of (the Caprices), my favorite ones," he said. The program also includes Bach's Concerto in E Major; Tartini's "Devil's Trill Sonata"; Mozart Divertimento K. 136; and Paganini's "Le Streghe." Violinist Qingyu Chen, 14, will play Marcello's Adagio from the Oboe Concerto in D Minor, an arrangement by Markov's father, Albert Markov. Markov actually lives just a few doors down from Carnegie Hall, where he gave his first performance at the age of 16. "I'm just going to go directly on stage, I don't even need a dressing room because it's that close!" Markov said. "To me, and I'm sure to many of my colleagues, Carnegie Hall has this incredible energy and history. I get chills, thinking of Tchaikovsky himself, opening up Carnegie Hall by conducting at its first concert in 1891. And then there are all the phenomenal orchestras and soloists and everybody since that time." Markov, who won the gold at the 1982 Paganini International Violin Competition and received an Avery Fisher Career Grant in 1987, also has a not-so-secret penchant for heavy metal music and enjoys exploring the possibilities of his six-string gold-plated electric fiddle, designed for him by James V. Remington. He and Remington collaborated on a Rock Concerto for electric violin, rock band, symphony orchestra and chorus. The piece has evolved over the past decade, during which he's performed it in places such as London, New York, Russia and Istanbul. That fascination with rock 'n' roll started when he was a teenager. Though he had nearly the entire violin repertoire under his fingers, he longed for a different kind of musical challenge. "When I went to high school, my buddies were listening to all those bands like Metallica and Led Zeppelin, and I discovered a whole new musical expression in it," he said. "What I found especially creative was the fact that these artists don't just perform music, they also write it. If you are a serious rock band, you write your own songs. I found this extremely challenging: One part of my brain was already very developed in performing, but another part of my brain was completely undeveloped." Markov's rock idols tend to be electric guitar hotshots like Jimi Hendrix, and Jimmy Page of Led Zeppelin. When he asked Remington to design his violin, "I asked him if he could design a violin that would also look the part. So he came up with a violin that looks like a mixture of violin and guitar in one. It's also covered with gold, by the way, real gold. I went to a special gilder and he put 22-karat gold on it." He enjoys taking that fiddle to outreach programs for kids. He'll play some classical music then he'll unveil the gold electric. "They go crazy, they all get excited. It's a really nice feeling." He tried the same formula, playing at the Barclays Center in New York for an NBA halftime show. "They put you in the middle of the basketball court, and you see all the famous athletes looking at you, and 20,000 sports fans," he said. "I was completely alone because they just wanted me to do my own thing. So first I took my classical violin and I played the 24th Caprice, kind of a short version, paying respect to the classical roots. Then of course I took my gold electric violin and I played some rock 'n' roll, it really was an exciting moment." Of course, Markov won't be playing on his electric for Friday's classical concert; his classical violin is a 1970 Sergio Peresson. "He was such a sweet man," Markov said of Peresson, who died in 1991. The Markovs fled the Soviet Union in 1975, and when Albert Markov arrived in the United States with his wife Marina (also a violinist) and son Alexander, he found himself without an adequate instrument. "You can imagine, we came to America and my father at that time was extremely active, he was playing as a soloist with the American Symphony, the Baltimore Symphony -- all these fantastic American orchestras. He had a great instrument in Russia, but he couldn't take it from the country, the government wouldn't let him. He had to take a factory-made." After struggling to procure a good instrument, "Peresson gave him one of his," Markov said. "At that time, I was just this little high school kid, and he was so sweet to me. He lent me one of his, and he said, 'Whenever you make enough for buying it, that's fine.'" When Alexander was later in a position to buy one, Peresson lent him one of his violins to use while he fixed up the one he would be buying. But Alexander fell in love with the loaner. "The loaner turned out to be so much stronger than the one that I wanted to buy, so I was begging him, 'Can I buy the loaner instead?'" He said no; Peresson kept that violin as evidence that his older instruments keep their sound well, because his competitors were spreading rumors that his violins didn't keep their sound. He relented after Markov recorded his video of the Paganini Caprices on that violin. "Finally they said okay, you can buy it. It was very sweet." "Some years ago somebody lent me a del Gesù, which I used for a few years," Markov said. "Then after 9/11, when I saw the horrible way they treat you at the airport with all the security, it became too much pressure. It was a phenomenal instrument, but believe it or not, when I switched back to my Peresson, I didn't feel that I lost anything. The Peresson is just a phenomenal instrument, it projects so well in large halls, and it still has the warmth." Another thing that Alexander has continually returned to in his life is his first teacher: his father. "I was born, as you know, in a family of musicians. My father, Albert Markov, has been my main teacher over the years. And my mom, Marina, is also a violinist who worked in Russia at the Bolshoi Opera and in New York with the Mostly Mozart Festival and the New York City Opera, which recently closed, sadly." An only child, Alexander knew he wanted to be a violinist from an early age. "My father showed me some exercises and some studies, and it just turned out to be such a natural process to me," he said. While Albert Markov was his main teacher, Alexander studied briefly at Juilliard with Ivan Galamian, right before his death in 1981. "He was a very sweet man, by the way, and he arranged a full scholarship for me," he said. "But I felt that he was a little bit academic for my personal taste. I was in those rebellious teenage years, and I wanted to have more freedom. He would insist on certain bowings and fingerings -- and only his own way. So luckily, though he was my official Juilliard teacher, my father was still my main teacher, and I continued with him through the years." Watching Alexander Markov play, it's not difficult to detect that he has a somewhat unconventional way of holding the violin and bow and executing various techniques. "It's all good to follow and respect traditions, but at the same time, sometimes it's good to also reflect and see a bigger picture of what we do as artists," Markov said. "Like they say, 'The biggest risk is not taking one.' And that's how I've felt with technique." "I've been always fascinated by Paganini," Markov said. "Since I was a child, I read so many books on him -- all those incredible stories about him as this mysterious 19th-century person. I had the honor to play on his own violin. Paganini was so much ahead of his time; he revolutionized everything, and he did it by getting out of the box and trying to do something completely new. If you just follow the rules, you'll never be like another Paganini, I don't think." And how did his father handle this "out-of-the-box" personality in his son? "My father was very reasonable to me, that's one of the reasons why we got along terrifically on kind of a teacher-student level," Markov said. "He had this really amazing intuition. He could detect the problems and try to improve on them, then at the same time he gave me space for what was already strong and allowed me to develop on my own in that direction." 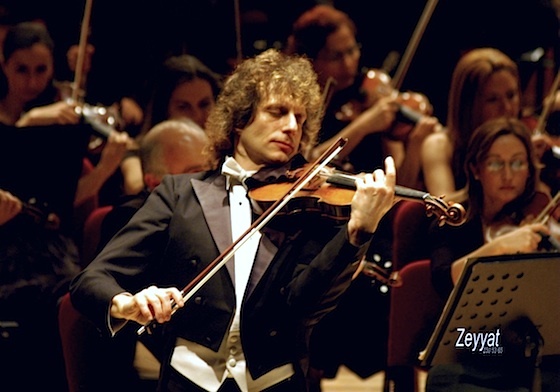 June 11, 2014 at 02:48 AM · A great master of the violin, terribly under appreciated... I wish there were more recordings available, with some Sarasate, Ernst, Vieuxtemps, Wieniawski, more Paganini, etc. June 11, 2014 at 06:25 PM · I'm waiting for the concert with all the Mazas Etudes. June 16, 2014 at 02:49 AM · Daniel Majeske, then concertmaster of the Cleveland Orchestra, performed them in a recital at the Cleveland Music School Settlement in 1975. I was there with my father and essentially the entire violinistic world of Northeast Ohio. I think this was soon after releasing an LP reportedly recorded in a single take, the only exceptions being to cover some aircraft noise. June 16, 2014 at 02:52 PM · Alexander Markov is the reincarnation of Paganini ! He is a genius !